A basement entrance can really change the use of your basement in a big way. You might refer to them as outside steps, a cellar entrance, or a Bilco entrance. Whatever the name a covered Bilco Perma Entrance will give you an all-weather outside cover, a set of precast concrete steps, and lastly a lockable inside insulated steel entrance door. All these quality features make a basement entrance a long-lasting usable investment. So what kind of uses might a basement entrance fit well for? An often mentioned one is a wood furnace. The concrete steps and heavy steel door make this a perfect application for carrying wood into and ashes out of your basement. Another way homeowners are finding to use entrances is in conjunction with woodworking or some other larger craft or hobbies projects. Some time homes are just not laid out in such a way to easily access the basement with larger or perhaps a bit messy items. Whatever your reason a basement entrance can make lots of difference. 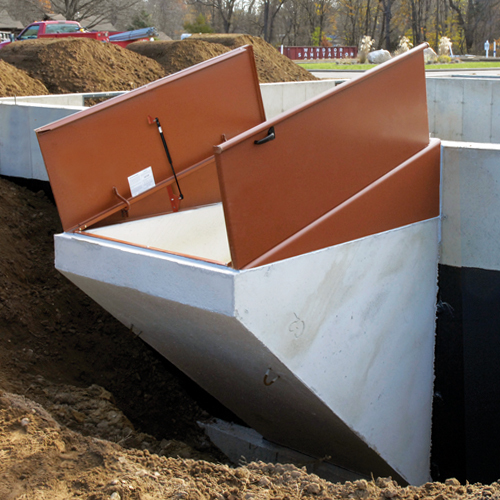 How are basement entrances installed in your basement? First, the process is the same whether you have an existing basement or we are installing a new basement under your home. The starting point is the excavation beside the house. It has to extend beyond the walls far enough to allow the installation to take place. This is almost always less than 8′. An opening for the insulated hollow metal door has to be created in your basement wall. Then the walls will have to be inspected. Usually, they will require additional reinforcing to be added to support the basement entrance. After this, the actual stairway is sealed and bolted in place. Once the outside cover and inside door are installed the Perma entrance is ready to use. Usually, the basement entrance will be installed in just one day. ← Moving my house to another lot, is that possible?